Matsa Resources has hauled the last ore from the Red Dog gold project to AngloGold Ashanti’s Sunrise Dam gold mine. Matsa completed this delivery on December 24 last year, achieving a $5.5 million operating profit and delivering 185,730 tonnes of ore at an average of 2.3 grams of gold per tonne (12,704 ounces of production). 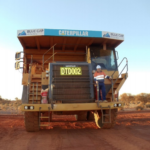 The company’s mining works at Red Dog, located within the 620 square kilometre Lake Carey project area in Western Australia, ran for four months from August to November last year. Its posted operating profit and tonnage were both slightly ahead of the targets set out in a July 2018 mining study, with profit roughly $100,000 above target and tonnage 3730 tonnes above target. “I am delighted that mining at the Red Dog gold project produced a result that met expectations, producing an operating profit of $5.5 million despite highly unusual and unexpected weather delays,” Matsa executive chairman Paul Poli said. Poli also announced that due to Matsa’s successful operations at Red Dog, the company board will pay a dividend to shareholders of 0.2 cents per share. Matsa is now exploring two possible small-scale projects within the Lake Carey project area. The company is preparing mine plans with an eye to starting production at the projects this year.